Describing the rules of Quelf doesn’t really do it justice. By design, the gameplay mechanics are simple. The board has a round path with a start and end point. You roll dice to move that number of spaces forward. Whoever gets to the end first wins. Simple. No complex math, no complicated play styles. Just roll the dice. Scatterbrainz (Red): These cards are a group game. Each card contains two categories to choose from, like “Ways to cook eggs” or “Places you’ve been naked.” (A real card in my older print of the game.) The group goes around and lists of things that qualify, without repeating anything. The first person to repeat something or fail to come up with an answer pay the penalty. Roolz (Blue): Yes, they all have ZaNy NaMeZ. Rule cards give the person who drew them (or in some cases the whole table) a new rule to follow. For example, “While it is your turn, you must casually talk about your homeland of Sri Lanka and the plight of the timber wolf.” Again, real. These stay in effect until they’re replaced by another rule card or the game ends. Stuntz (Yellow): Remember Double Dare? These are the games equivalent of the Physical Challenge. Some are simple like a card instructing you to lick your own elbow or, failing that, lick someone else’s elbow. Others are more elaborate, like a classified card that instructs you to literally cheat until your next turn or else. Quizzle (Green): These are generally straightforward trivia questions, with a few riddles thrown in. It’s a mercy to your self-respect when you land here. If you read all of that and thought it was too silly or cringey, then the game is not for you. It’s a pretty easy litmus test! 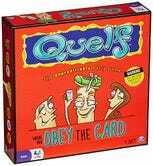 Quelf is specifically designed not only to avoid taking itself too seriously, but for the players to do so as well. Congratulations, you got played by an inanimate card. With the right group of people who can go with the flow, Quelf becomes less of a game and more of a story generator for your friends. Once, a blue card instructed a friend of mine to keep one hand on the floor whenever it wasn’t his turn. Our table was not low to the ground. He was a pretty big guy, but his head was only barely able to peek over the edge for most of the game. He wasn’t happy. We thought it was a riot. It’s a quick draw contest! Pick an opponent. Set the timer and each of you must draw a picture of a baby, a fork, a whistle, and an alligator. When the timer runs out, show everyone your drawings. The remaining opponents must fairly judge which of you is the better artist. Whoever loses pays the penalty. There were three people at the table, myself included. I’m no artist. The other two were. I chose, knowing my fate. We flipped the sand timer (which can’t possibly last more than 30 seconds). My opponent worked diligently and creatively. Rather than creating four separate drawings, she drew a baby alligator, whistling, while holding a fork. It was very nearly a tie (or draw, if you prefer). Art is subjective and the game itself can cast no judgment on me. My opponent was wheezing on the floor, shouting in between gasps of cackles, “I tried! I tried so hard! !” And she did. But it didn’t matter. Effort doesn’t matter in this game. Strategy doesn’t matter. Even chance doesn’t matter, as being lucky can only get you so far. 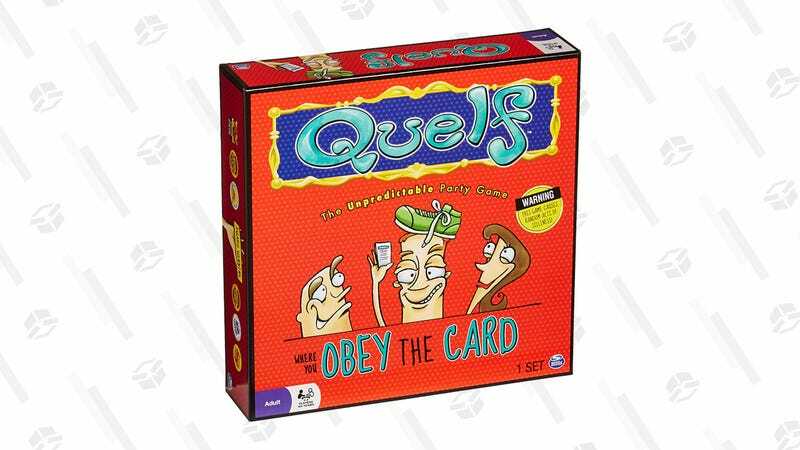 The only way to win Quelf is to let go of your pride, indulge the performer in you, and let dignity sit in a bowl by the door with everyone else’s. I did lose that round, because the remaining player acting as judge decided so. Fair. I don’t remember who won the overall game, though. What I remember is these drawings, still on my fridge to this day. I remember the experiences I had with friends who for a brief afternoon, let themselves be absurd without criticism.